SUSAN ELIA MACNEAL: BREAKING REDS NEWS! Red Hallie Ephron's THERE WAS AN OLD WOMAN is #14 on the New York Times eBook list! Way to go, Hallie! We're all so, so, so happy for you! Happy book birthday to Caroline and Charles Todd! 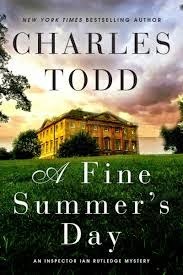 Their newest novel, under the pen name Charles Todd, is A FINE SUMMER'S DAY. This novel is the latest in the acclaimed New York Times-bestselling Ian Rutledge series, about a brilliant but troubled Scotland Yard detective suffering from what we would now call PTSD after World War I. It's one of Hilary Clinton's favorite series and had a wonderful write-up in yesterday's New York Times Book Review. A FINE SUMMER'S DAY is the seventeenth book in the Inspector Ian Rutledge series, and this one comes with a twist — it's a prequel, meaning we meet a young Rutledge before the war. Before he — and Britain — were changed forever. And now, I am honored and delighted to introduce — Caroline and Charles Todd! 1. How did you come up with your character Ian Rutledge? Caroline: I don’t really know. We wanted several things—to set A TEST OF WILLS in England because the Great War killed a generation of her young men, and we felt it would be interesting to see how a survivor of that war would return to civilian life—and to deal with murders committed by ordinary people, not gangsters or drug dealers or terrorists. The WHY rather than the how. And so we needed a man capable of understanding people. Somehow we simply lucked out. I think I’ve been half in love with Rutledge ever since. Charles: Like the Bess Crawford series, we needed a character of his times, one who could act on his own. Much as we enjoy CSI, we didn’t want Forensics to solve the crime for our Inspector. Looking back to that first glimmer of Rutledge, he seemed to set the stage himself, rather than being “created” by us. And I think that’s been his strength, just as it is Bess Crawford’s strength. 2. Why did you decide to set the new mystery, A Fine Summer's Day, in 1914? Caroline: After sixteen Rutledge mysteries, where we’d been examining him after the war, we were curious to see what sort of man he was before the trenches changed him forever. We weren’t sure we could carry it off, and yet, from the very first page, we realized that we must have known these things about him, however subconsciously. We couldn’t have done him justice in A TEST OF WILLS and the subsequent books if we hadn’t understood the bedrock of his mind and personality before the Battle of the Somme in 1916. It was an amazing journey of discovery on our parts. Charles: As fans of the mystery ourselves, we’d come to admire so many characters created by other authors. From Poirot to Dalgliesh, from Duncan Kincaid to Gamache, even Joe Leaphorn and Reacher and Stanley. It never occurred to us starting out with Rutledge that we might be creating another well known character. But he’s his own man, and we discovered while writing A FINE SUMMER’S DAY that he’s still full of surprises. 3. What kind of research do you do for your novels? Charles and Caroline: You can’t write a good mystery without equally thorough research. In our case, with both series, we realized early on that we had to go to England if we wanted to get the time and the language and the settings right. We also look for first hand sources of information about the period and the war. A friend found a little book by Florence Nightingale that was an interesting glimpse into what was known about dealing with war wounds and medicine at the time. Letters and memoirs and photographs are very important. But you have to be careful using a book written after 1920, you have to check that modern research hasn’t turned up information that a character living at the time couldn’t or wouldn’t have known. And England has lovely military museums. These and the ones here are an endless resource. 4. Do you generally know how your books will end before you start writing, or do you make changes as you go along? Caroline: We have no idea from page one forward who did it or why. We let the story evolve and the characters tell us what we need to know. And I think that’s a good thing, because it keeps the reader guessing too. We never outline, or write a proposal, because we prefer to be surprised as we work. Other writers thrive on outlines. That always amazes me because I was never good at them. Anyone who is has my respect. Charles: My father, who was our proofreader for many years, always worried about the ending because when we handed him a chapter, he knew that the next one hadn’t been written yet, and having the logical mind of a chemical engineer, he was afraid we might find ourselves going astray before he could find out who did it and why. Somehow we never did, and he’d laugh and say, “I don’t know how you managed it this time.” And sometimes we weren’t sure how we did, either. Caroline and Charles: In December we turned in the next Bess Crawford. It will be out in late summer, and the title is A PATTERN OF LIES. It’s a mystery about our version of an actual event, and how a pattern of lies can warp and twist the truth until people start to believe them. We always love writing a Bess mystery. She’s one of our favorite people, and she’s fun as well as interesting. Her decision to become a nursing sister, her background in India, and her relationships with her flat mates, her parents, and of course Simon Brandon and even Sergeant Lassiter, and not least, her experiences in the war, give her so many dimensions that we never lack ideas for her series. Now, with that one finished and in production, we’re about to start the next Rutledge for the winter of 2016. Starting a new manuscript is always so exciting. Caroline: There’s a character in A FINE SUMMER’S DAY who just might walk back into this new Rutledge. You can almost hear her asking to reappear six years later… The question is, what will Rutledge have to say about that? Charles: We weren’t sure how reviewers would take this return to the Summer of 1914, but they got it right away, and I think Rutledge fans are going to find it very satisfying. SUSAN ELIA MACNEAL: Thank you, Caroline and Charles. I was lucky enough to receive a copy of A FINE SUMMER'S DAY and it is fabulous — a perfect start to the series for the new reader, or, for those of us following Inspector Rutledge, new insight into his character (along with a fascinating new mystery). Reds and lovely readers, what do you think about a prequel to a long-running mystery series? And what do you hope to learn about Inspector Rutledge from his past? ABOUT THE AUTHORS: Charles and Caroline Todd are a mother-and-son writing team who live on the east coast of the United States. Caroline has a BA in English Literature and History, and a Masters in International Relations. Charles has a BA in Communication Studies with an emphasis on Business Management, and a culinary arts degree that means he can boil more than water. Caroline has been married (to the same man) for umpteen years, and Charles is divorced. Happy Book Birthday to "A Fine Summer's Day." It's so exciting to have another Ian Rutledge book in hand. And I love the idea of a prequel . . . I think they're even more delightful in the midst of a long-running series. It puts a bit of a spotlight on the backstory of a beloved character, I suppose . . . .
Congratulations, Hallie . . . what wonderful news! I loved "There Was An Old Woman" . . . . The extent to which I adore the Rutledge books (well, and actually Rutledge himself) and the Todds is greater than even describable! It is such a joy to read each and ever y book (and Bess book, too,) and it's so fascinating to realize you two, Todds, have created a character who is equally as memorable as the icons you mentioned. ANd I cannot get over the brilliance of a prequel. Wow. Cannot wait to read! On a very silly little note--how do you come up with appropriate names? And we will see you at Malice, right???? a prequel is appropriate with much attention focused on 1914-8 right now, including those marvelous glass poppies at the Tower of London. I've always wondered what Rutledge was like before the war and Hamish and now I'll find out. I am a huge fan of the Bess Crawford books but haven't yet started on the Ian Rutledge books. Would you suggest that I begin with the prequel, since I haven't read any of the others yet? I do like the idea of prequels in a long-running series. After getting to know the characters in the "now", I find myself wondering how he or she came to be the type of person he/she is today. First, congrats Hallie! How splendid - wonderful book. I like the idea of a prequel, even after you "know" a character. I think it shines a new spotlight on him or her and may uncover things you never really thought about (as a writer and reader). This is one of my favorite series and they do it so well. I'm nervous about the prequel but I have it ordered and it will arrive today. Sometimes because the reader already knows what comes after, it loses its oomph. I am really looking forward to reading this. Hallie, what great news about a well-deserving book! Onward and upward! At one of the book conferences I've been to in the last couple of years my book bag held a Rutledge book, a series new to me. It was great, and now I am on a quest to read the whole series. Well done, Todds. Thank you for the grand entertainment. Hallie, well done! So excited for you! And I've been a big fan of the Todds' books for years, and am particularly excited by the chance to get a look into Rutledge's past. There's such an elegiac feel to the summer of 1914 - it wasn't just that war was about to break and lives would be lost, it was that an entire way of life was about to vanish forever in England and Europe. Julia, "elegiac" — what a perfect word to describe both that time and this novel. Deb, I think you could either start with this book or at the official beginning. It will be a hard choice for newcomers to the series! Congrats to Caroline and Charles! Congrats to Hallie! Julia, well said. No one could possibly have foreseen how dramatically the world would change because of WWI. Our generation, I think, came out of the drama of WWII--we heard the war stories from our own parents, felt the reverberations post-war in our lives--and WWI seemed so long ago and far away. It was only a few years ago, that I realized my Grandfather Church served in WWI--he was born in the 1890s. After reading the wonderful, amazing,brilliant stories of Ian Rutledge, I began to understand something about the horrors of that war. And it shone a certain light on the man my grandfather was, once I learned where he fought and when. I'm greedy to learn as much as I can about Rutledge, so I find the idea of a prequel fascinating and look forward to getting a copy in my hot little hands! Why I love historical mysteries like Charles Todd’s books (who are at the top of the list of authors who do it well and who I recommend to those getting started in the sub-genre). I love learning about people and places and events from another time and fiction is one of the best ways to do it. Most authors make every attempt to be accurate in their facts. Also, in their writerly inventiveness within the story, they try to make what happens POSSIBLE given the situations and not just flights of fancy. Second, I love mysteries that don’t rely on the magic of modern conveniences, i.e., fingerprints, DNA, electronics. I like good old-fashioned talking to people and piecing together what happened and prior to, say, 1940s that was usually the only way to solve a crime. And maybe the author has to work a little harder for it to all come together and still be an interesting read. (Before 1941, fingerprints were not accepted as evidence in court in US). Finally, authors have the time period of all mankind to pull from and that leaves a lot of books for us to read. Yes, there’ve been cavemen mysteries (I have not read them). Kaye George has written a Neanderthal mystery - Death in the Time of Ice. It's gotten some good reviews. Looking forward to look back into Rutledge's history. 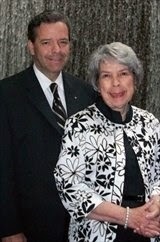 Looking forward to seeing the Todd's at Malice - where they will rightfully be honored. Regrets. I've had a few, but then again, too few to mention. Well, my biggest reading regret to date is worth mentioning because it is not having yet started on the books of Charles Todd. It didn't used to overwhelm me when I was faced with a series of 16 books or so. I'd hunker down and come up for air after getting up to speed. However, it seems like there are now so many authors I have to keep up with and new books arriving almost daily that to take on a task of a complete series is too daunting. So, it is with great excitement that I am reading about A Fine Summer's Day. I think it will be a great jumping off point for me with the Ian Rutledge series. Now, for Bess Crawford, that I know I will love, too, I will have some of that under my belt by Bouchercon this year, too. I so admire Charles and Caroline that I have vowed to not meet them again without having started their wonderful books that everyone raves about. Congratulations, Charles and Caroline, on your publication day and all of your much deserved success. Hallie, congratulations go out to you, too, for the New York Times e-book placement! There Was an Old Woman is such a great read. Safe travels and can't recommend these books highly enough to those two people in the universe who haven't yet tried them. Charles and Caroline, welcome to Jungle Reds. A presequel is a great idea. Since I am new to Rutledge, I thought of starting the series with the presequel. This sounds like the type of series you can dive into and pull on like a second skin. Can't wait to start reading. A must get for the Kindle. Sorry to be so late to the party today! Huge congrats to Hallie, and Happy Pub Day to Caroline and Charles!! I've said many times how much I love this series, and A Fine Summer's Day is a brilliant addition. So clever to think of writing a prequel, Caroline and Charles. This book makes a great starting point for those who have not read the series. For those of us who have, it is a beautifully constructed story on its own, but there is a lovely and hauntingly elegiac quality to it. Think the first season of Downton, when you knew what was coming but the characters did not... Makes me shiver to think of it. A Fine Summer's Day is a must!